A Cessna T206H Turbo Stationair that flew a circular pattern over Tucson for weeks. It was the buzzing that caught Keith Powell’s attention. 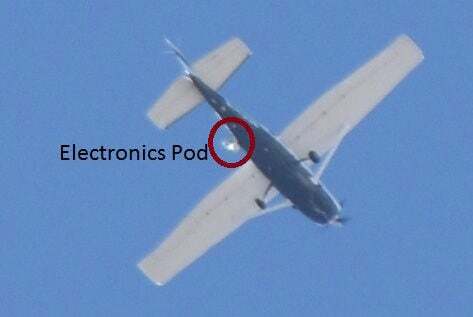 In late February or early March, Powell, an optical scientist at the University of Arizona, began hearing and seeing a small plane flying low over his Catalina Foothills home. No big deal — at first. But days went by, then weeks and the same small plane just kept circling and circling over Tucson, with part of its flight path crossing over his home. Naturally, Powell got annoyed — and curious. When he went searching, he discovered something others around the country have researched and discovered themselves. That buzzing mosquito of a Cessna, circling around and around over the city, belonged to the FBI. Of course, this may sound like a wild-eyed conspiracy theory. It isn’t. Last year, a variety of news outlets investigated sightings of planes flying in circles over cities and uncovered a widespread pattern of planes registered to dummy companies that were in fact fronts for the FBI. Jack Gillum, a native Tucsonan who used to work at the Arizona Daily Star and now reports for The Associated Press in Washington, D.C., led the most sweeping journalistic investigation last year. A year ago, Gillum and his AP colleagues found that the FBI had been flying over 30 cities in 11 states across the country during a previous 30-day period. Some of the planes are bristling with surveillance equipment, they found: video, audio and, at times, cellphone tracking equipment. But the FBI said the planes aren’t doing bulk collection of information. This is, of course, small comfort. The regular patterns of flight times and paths that Powell observed suggested something more routine than, for example, watching a specific suspect move about the city. Powell said the circles over his house lasted from early March to late May. He wasn’t the only Tucsonan puzzling over the flights. Tucson musician Glenn Weyant noticed similar flights last year. 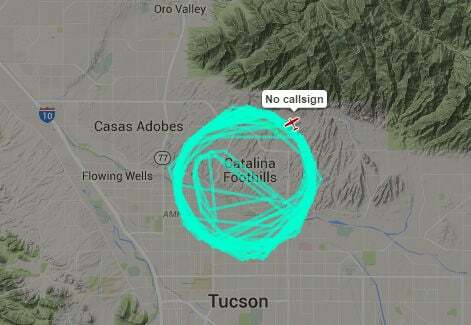 Both Weyant and Powell used the same website — FlightRadar24.com — to figure out why they kept hearing and seeing small planes circling over Tucson. That’s a website that tracks flights according to their positions on radar all over the country. It lists the identification number of each plane, the model of the aircraft, its owner, altitude, flight speed and direction, and in the case of commercial flights, the origin and destination. When Powell figured out who was behind the annoying overflights, he did one of those only-in-America things: He called the FBI and complained. Two days later, the flights stopped appearing on the website, though they continued over his house for a few weeks. On the website, there was a difference in the planes that Weyant initially saw last year and what Powell saw this year. Last year’s circling planes were actually shown on FlightRadar24.com as being registered to the Department of Homeland Security. The FBI flights that caught attention in March were registered to a front company called NBY Productions. That’s one of the names that was turned up in last year’s journalistic investigations. Weyant is especially perceptive to sound. He’s a man who has played the border fence, sculptures around town and otherwise revealed the sounds of everyday life as a soundscape of our world. He’s pretty deep. Weyant is not convinced by government assurances that the flights target specific individuals. Perceptively, he points out that in nature, when you’re being circled, you’re being stalked. Think of hawks, vultures and sharks. Then there are other data points to consider. Last month, a San Francisco television station revealed the FBI has planted microphones and recording devices in bus stops, outside courthouses and elsewhere. If you’re like me, you still want to believe that they’re acting in our interests. That they’re tracking criminals, smugglers, aspiring terrorists. But with planes circling and microphones scattered around the cities, you have to wonder. Jay Stanley, a senior policy analyst on privacy and technology for the ACLU, explained the broad context when we talked Friday. “During the Cold War, the United States built up an extensive surveillance operation aimed largely outward at the Soviet Union and other nation states,” Stanley said. “Inward” means “on us.” What they can detect, I’m sure, would boggle our minds. How they are using those powers — for us, or against us — is something we ought to demand that they tell. With four justices of the peace leaving office, candidates pile in. Right-wing stances put at risk hard-won victories over workplace issues. Politics may explain why Arizona keeps making the same losing arguments. Tucson is one of many places where survivors have turned pain into action.